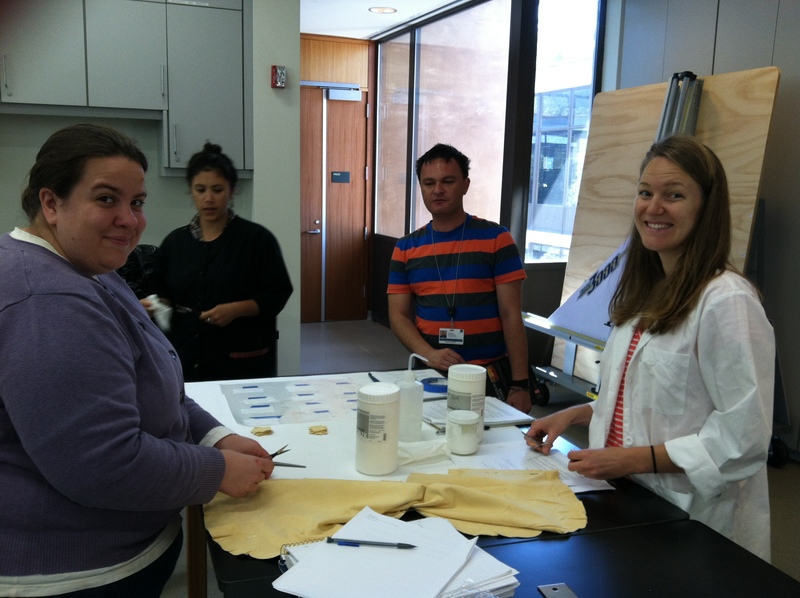 The UCLA/Getty Conservation students investigated adhesives for leather this past Tuesday as a practicum, taught by Andrew W. Mellon Resident in Conservation Education Tharron Bloomfield, for their Deterioration and Conservation of Organic Materials III course (CAEM 241). 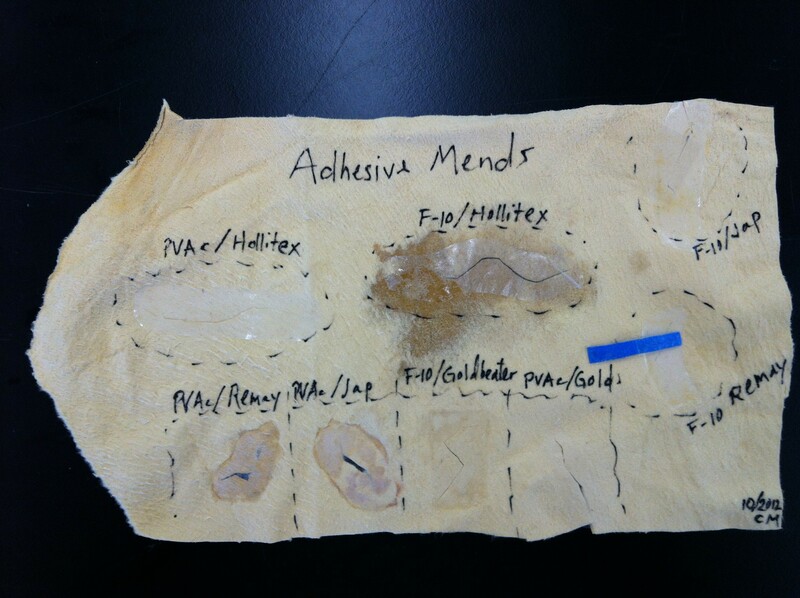 Students divided themselves into three groups each with a different set of adhesives and application methods to test. All groups worked with oil-tanned leather scraps (chamois) on which they created their own rips, cuts, or tears. Each group also worked with four carriers for the adhesives: Hollytex, Reemay, Japanese tissue paper, and Goldbeater’s skin. Heat spatulas were used to apply the heat set adhesives. One group working with Beva 371 film tested different methods for applying the film to the carrier and the mend. They also investigated the application of Beva at different temperatures and the strength each mend created. Through testing, they realized their preference for using a two-step application for the repair, where the Beva is heat set onto a carrier, which is then heat set onto the damaged area. Carrine Tzadik, Alexis North, and Brittany Dolph (L to R) evaluate the process of heat setting Beva film to different carriers. Another group focused on Lascaux 360HV, Lascaux 498HV, and a 1:1 combination of the two adhesives They tested the performance with immediate tack and painting the adhesive into a film with one or multiple coats, and then heat setting. This group had varying opinions about the effectiveness of some of the carriers. Some liked the smooth texture of Reemay and felt that mends using this carrier were structurally sound while others thought it needed too much application of heat to set. In one case, this group saw significant damage to the leather substrate due to too high of a temperature used during the heat application, causing changes in the physical properties of the leather. A third group worked individually on applications of Paraloid F-10 in mineral spirits and 48% PVAc AYAF in acetone for patch mends and bridge mends. They tested various methods of solvent setting as well as heat setting. They had a visual preference for the mends with Goldbeater’s skin and saw damage in the form of tidelines and darkening to the leather in the use of the solvents to set the adhesive. An example of the testing conducted by Caitlin Mahony in the group investing PVAc AYAF and Acryloid F-10. Other group member Casey Mallinckrodt also developed her own system of testing the mends. 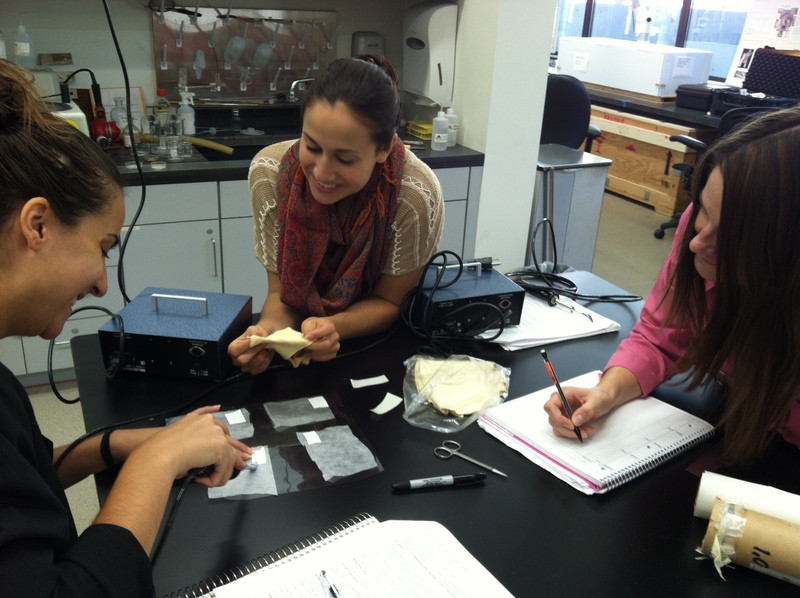 At the end of the practicum, students felt more informed about adhesive options for leather and are ready to begin treatment on their leather objects from the Fowler Museum this quarter. Categories: Courses, Det. & Conservation of Organic Materials III | Tags: adhesives, Beva 371, Lascaux 360HV, Lascaux 498HV, leather, mending, Paraloid F-10, PVAc AYAF, tear repair | Permalink.